Life is short, and every day is a gift from God. 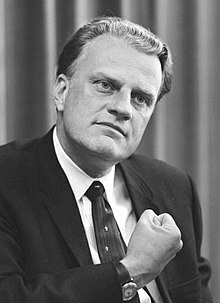 William Franklin Graham, Jr. (November 7, 1918 - February 21, 2018), better known as Billy Graham, was an Evangelical Christian and an evangelist. For the wrestler of this name, see Billy Graham (wrestler). Either communism must die or Christianity must die because it's actually a battle between Christ and anti-Christ. I have come out in favor of birth control but sterilization is a crippling of a vital body function. Commitment to great causes makes great men. I don't want to see religious bigotry in any form. It would disturb me if there was a wedding between the religious fundamentalists and the political right. The hard right has no interest in religion except to manipulate it. In my travels, I have found that those who keep heaven in view remain serene and cheerful in the darkest day. If the glories of Heaven were more real to us, if we lived less for material things and more for things eternal and spiritual, we would be less easily disturbed by this present life. Hope for the Troubled Heart: Finding God in the Midst of Pain (1991); the last statement of this anecdote has often become quoted as if it originated with Graham: "My home is in Heaven. I'm just traveling through this world." "What is the greatest surprise you have found about life?” a university student asked me several years ago. "Its brevity" I replied without hesitation. … Time moves so quickly, and no matter who we are or what we have done, the time will come when our lives will be over. As Jesus said, "As long as it is day, we must do the work of him who sent me. Night is coming, when no one can work" (John 9:4). … Life is short, and every day is a gift from God. I don’t know the future, but I do know this: the best is yet to be! Heaven awaits us, and that will be far, far more glorious than anything we can ever imagine. I know that soon my life will be over. I thank God for it, and for all He has given me in this life. But I look forward to Heaven. I look forward to the reunion with friends and loved ones who have gone on before. I look forward to Heaven’s freedom from sorrow and pain. I also look forward to serving God in ways we can’t begin to imagine, for the Bible makes it clear that Heaven is not a place of idleness. And most of all, I look forward to seeing Christ and bowing before Him in praise and gratitude for all He has done for us, and for using me on this earth by His grace — just as I am. Next week, Graham's corpse will lie in state at the Capitol rotunda – only the fourth private citizen to be so honored, and the first since Rosa Parks in 1995. This is a disgrace. But in a certain way, it's also right and fitting – as oddly appropriate as Graham's star on the Hollywood Walk of Fame. If Billy Graham was, ultimately, a conniving hypocrite with a layman's grasp of the Bible and a supernatural lust for earthly power, he was also a quintessential American success story. He was not so much "America's pastor" as its greatest evangelical entrepreneur – the man who launched a whole separatist (and lucrative) Christian media culture, who laid the foundations for megachurches and prosperity ministries, who brought Jesus back into American politics. He was a public-relations savant, a shameless sycophant who whispered sweet nothings to power in lieu of hard truths. He demonstrated what fortunes could be made, and what human glory could be attained, by transforming evangelical Christianity into a patriotic corporate entity. If that's not American, by God, what is? Bob Moser, "The Soul-Crushing Legacy of Billy Graham," in Rolling Stone, February 23, 2018.